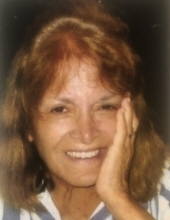 The Funeral Mass for Vivian Daood Boone will be at 10:00 a.m. on Saturday, November 17, 2018, at Holy Spirit Parish, 608 Farragut St, Millvale, PA 15209. Viewing will be held that same morning starting at 9:00 a.m. in the Church. The burial will be at St. Anthony’s Cemetery in Shaler Township. Vivian died on the Solemnity of All Saints Day, November 1, 2018, at the age of 85. Vivian Judith Daood was born April 30, 1933, in Pittsburgh, Pennsylvania, to Joseph and Anna (Ellis) Daood. She attended Friday Street School, graduated from Millvale High School, and attended the Pittsburgh Art Institute. She was an accomplished artist. She began her professional art career at Kaufmann’s Department Store in downtown Pittsburgh. Beginning as a fashion artist doing pen-and-ink drawings in newspaper and magazine ads for Kauffman’s, she expanded to other major retailers such as Wanamaker’s in Philadelphia, and Ivey’s and Belk at their headquarters in Charlotte. In Charlotte, Vivian met Landon Boone, and they were married in 1983. Dorothy Roman was Vivian’s maid of honor. Vivian retired from Belk in 1997. In 2002, her beloved Landon died. She and two of her older sisters, Mae and Elizabeth, moved back to Millvale. She attended Mass daily at Holy Spirit Parish and was devoted to praying the Rosary and the Stations of the Cross. She generously helped her parish and was actively involved in its upkeep, cleaning, and repairs. Vivian is survived by her brother-in-law, Herbert S. Zischkau, Jr. (husband of Susan), of Winter Springs, FL, her sister-in-law, Susanne Daood (wife of Jeffrey) of Rochester, MN, and her cousins Dorothy Roman and Marion (Tony) Angelini, Sam Hazo, Jr., the husband of her cousin Mary Anne (Sarkis) Hazo, as well as her nieces and nephews: Sherry (Brud), Karen (Frank), Diane (Fred), Carol, Edward Jr. (Susan), Joanne (Rick), Christine (Jim), Peggy, Molly, Herbert III (Julie), Douglas (Mary), Eric (Martha), Jonathan (Alice), Walter Jr., Christopher (Jennifer), Michael (Alice), and Jeffery (Shelly). She is also survived by many great nieces and nephews. She was preceded in death by her husband, Landon, her parents, Joseph and Anna, and her brothers and sisters: Mae Daood, David (Margie) Daood, Peter Daood, Elizabeth Daood, Edward (Lydia) Daood, John (Anna Mae) Daood, Susan (Herbert Jr.) Zischkau, Jeanne (Walter) Parks, and Jeffrey (Susanne) Daood. She loved and prayed for her family very much and we pray that she now enjoys eternal joy and peace with her Heavenly Father. Amen. To send flowers or a remembrance gift to the family of Vivian Judith (Daood) Boone, please visit our Tribute Store. "Email Address" would like to share the life celebration of Vivian Judith (Daood) Boone. Click on the "link" to go to share a favorite memory or leave a condolence message for the family.